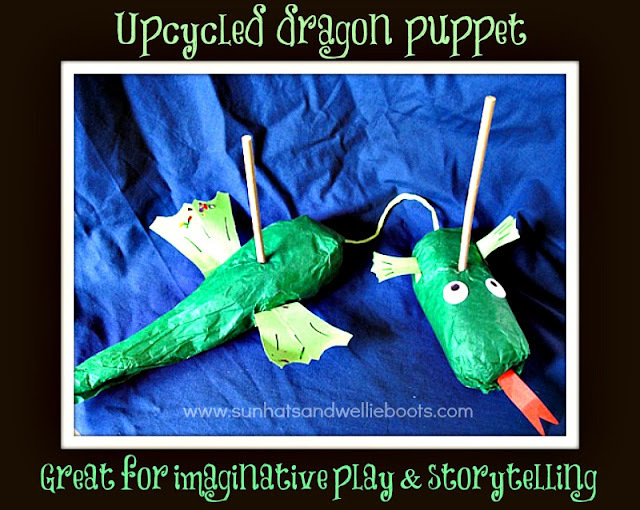 Looking for a fun frugal puppet? 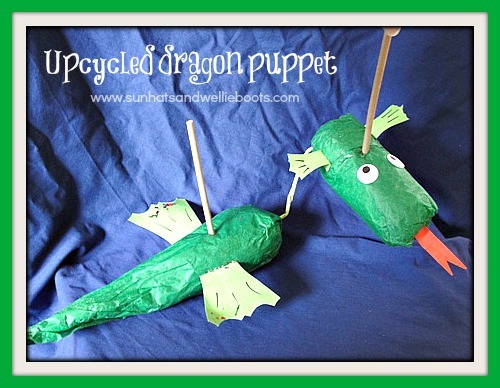 How about these DIY rod puppets made entirely from recycled materials. 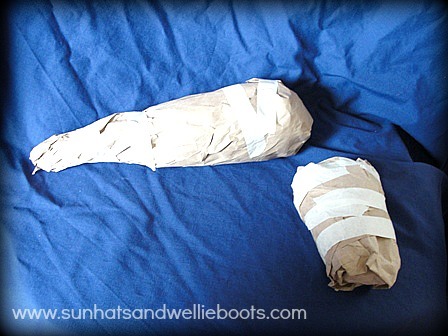 They are simple to put together, & offer so many play opportunities & endless fun. 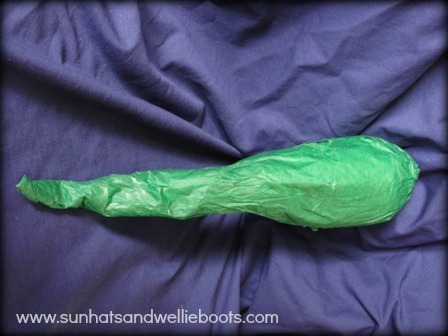 1) We made the body of our dragon puppet in the same way as our dragonfly puppets, scrunching the packing paper into a body shape & securing with masking tape. 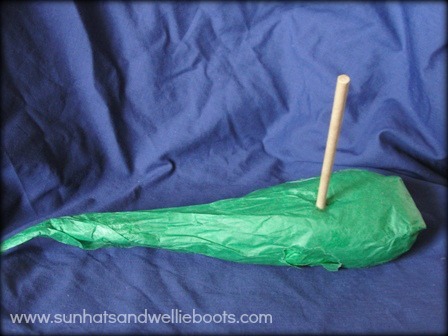 2) For the head we scrunched the paper into a small oblong shape, sealed with masking tape, & then covered both the head & body with green tissue paper, sealing with a glue stick. 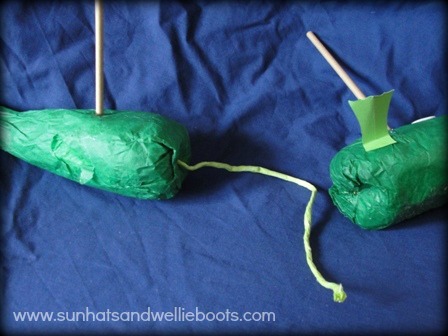 4) To join the head & body together we used green string (any strong string/ribbon can be used). Again using the screwdriver we made a hole in the puppet's body & side of the head, added strong glue to the hole & inserted the string. 5) We made wings & ears using scraps of green card, & used the red card to make the tongue. For the eyes we used recycled sticky foam disks & used a fine marker to add the detail. 6) And here's our dragon! 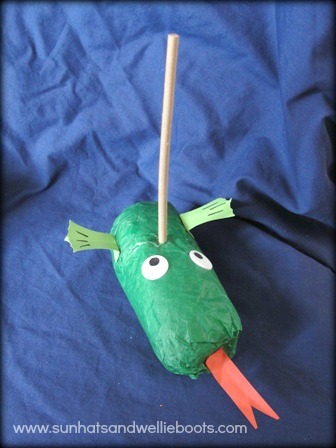 A perfect storytelling puppet for Harry Potter fans & a great puppet to explore for St George's Day! This puppet making technique could be used to make endless creations. 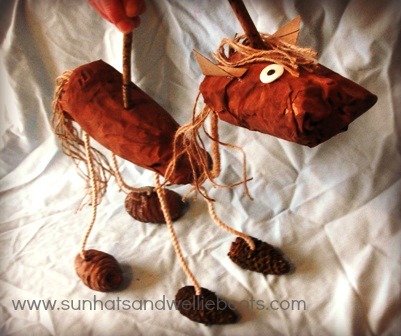 Here's our horse puppet made in the same style. Minnie has named her Dotty! Dotty was created using the same technique as the dragon puppet. Instead of covering in tissue paper, Minnie painted the body & head with brown paint. 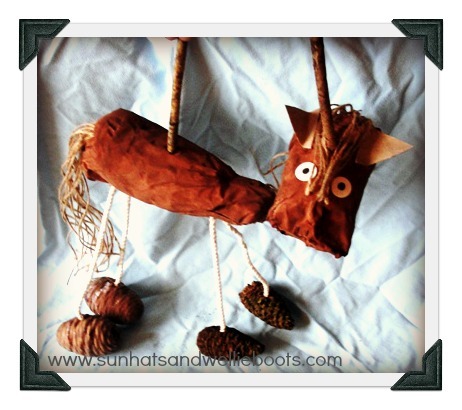 We used old garden rope to create the neck & legs, & garden string for the mane & tail. For Dotty's feet we used pine cones (collected on one of our woodland walks) & made a small hole in each before attaching the rope with glue. 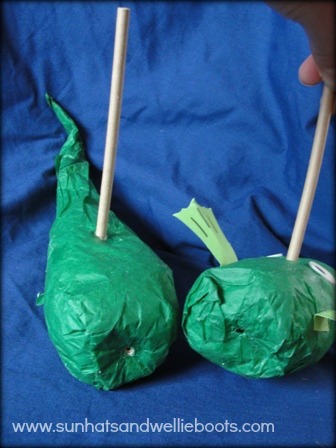 We used recycled card for the ears, foam disks for the eyes, & sticks from the garden to make the rods. A perfect prop to accompany stories & songs. So simple & frugal - I love it! A great activity for exploring creativity & design, colour, shape, size, movement (both of the puppet & own body). Great for inspiring play, imagination, language, creative storytelling, acting out familiar situations, & discovering imaginary worlds.